Just 50 metres from Munich Central Station, this hotel offers free wired internet and a daily breakfast buffet. 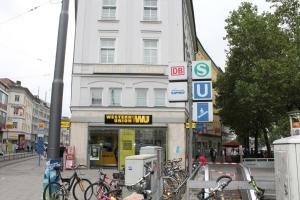 It is a 5-minute walk from Karlsplatz Square and the old town. Hotelpension Locarno is located on the 3rd floor of a building and can be reached by elevator. All rooms include smart wooden furniture, cable TV and a wash basin. Shared bathrooms and toilets can be found in the hallway. A buffet breakfast is available each morning at the Locarno. The cosy breakfast room can also be used as a lounge after breakfast. Many restaurants, bars and shops are within a 5-minute walk of the Locarno. The Central Station provides direct links to Munich Airport and Munich Trade Fair.